226 pages | 19 B/W Illus. 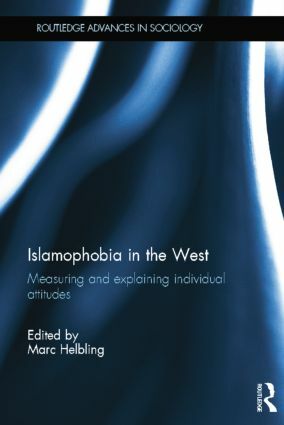 what exactly is Islamophobia and how can we measure it? how is it related to similar social phenomena, such as xenophobia? how widespread are Islamophobic attitudes, and how can they be explained? how are Muslims different from other outgroups and what role does terrorism and 9/11 play? Marc Helbling is Head of the research group 'Immigration Policies in Comparison' (IMPIC) at the Social Science Research Centre Berlin (WZB), Germany. His recent publications include Restructuring Political Conflict in Western Europe (Cambridge University Press, 2011, with Hanspeter Kriesi, Edgar Grande et al.) and Practising Citizenship and Heterogeneous Nationhood: Naturalisations in Swiss Municipalities (Amsterdam University Press, 2008). He has also published articles in journals such as the European Journal of Political Research, Ethnic and Racial Studies, and the Journal of Ethnic and Migration Studies.